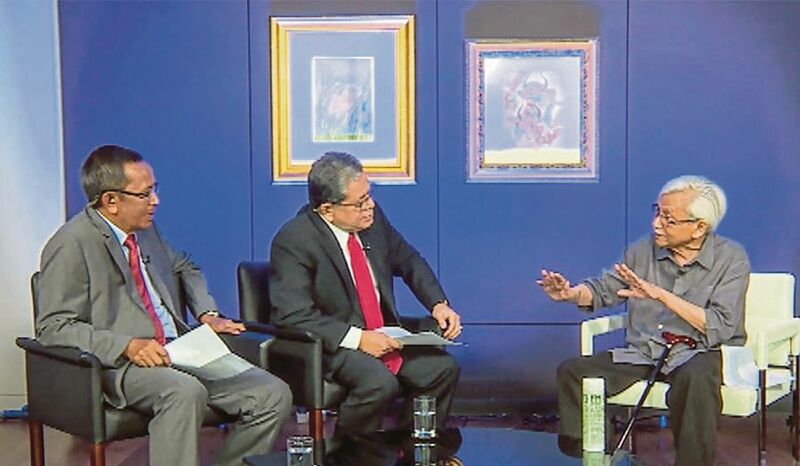 Tun Daim Zainuddin being interviewed by Tan Sri Johan Jaaffar and Mustapha Kamil on TV3 last Wednesday night. DID you catch the Tun Daim Zainuddin interview on TV3 last Wednesday night? He spoke on a wide range of issues, sharing insights and juicy behind-the-headline anecdotes. Those who missed it can click on Youtube. You won’t regret it. He was interviewed by retired but still active journalists, Tan Sri Johan Jaaffar and Mustapha Kamil. They were colleagues in the Media Prima group of companies until a few years ago. Johan maintains a weekly column in The Star newspaper while Mustapha is an active commentator on Facebook with a big following. Friends who saw the interview gave their thumbs up. A television interview is different from a newspaper interview. Speaking on air, viewers can see the expressions and listen carefully to the words and the manner in which they were uttered. An Umno activist told me the following day that Daim has not lost any of his sharpness when answering questions. He said it was a typical Daim show — short and crisp; straight to the point; and he didn’t duck any question thrown at him. But the Umno man said Daim was more talkative than usual, in so far as media interviews are concerned. I thought so too. To me, this was expected because Daim, as Tun Dr Mahathir Mohamad’s closest confidante, was sharing insights on events before, during and after the May 9 General Election. Daim is head of the Council of Eminent Persons, a body set up by the Pakatan Harapan (PH) government three days after it kicked out Barisan Nasional (BN) and Datuk Seri Najib Razak from Putrajaya. The council’s main objective was to dive deep into the administration with microscopes to find out the who, what, why, when, where and how the previous regime ran the country. Daim is not new to such assignments. Dr Mahathir had, in the late 90s, tasked Daim with tracking the economy and to suggest solutions to the problems faced by the country following the Asian financial crisis in 1997/98. Daim set about his task by tracking every aspect of the economy on a daily basis. It was a painstaking exercise but one that eventually helped Dr Mahathir to bring the country out of its huge problems. One could say that Daim is Dr Mahathir’s “fix-it” man. If there’s anything difficult, and complicated, that needed to be corrected, just send Daim. But Daim would be the first person to reject such acclaim, countering that no single person could do such a job. That task of tracking the economy was done by the National Economic Action Council which Dr Mahathir himself chaired. The NEAC was placed under the minister of special functions, a post held by Daim. So it was really a no-brainer for Dr Mahathir to pick Daim to dig deep into the Najib administration to find out what went wrong. Four months and one day after the general election, people are still talking about and analysing the history-making polls. Many people on the ground had anticipated a change, but they had not dared predict such a huge upset. Daim’s take on GE14 was typical. He told the interviewers and the audience that Umno and BN think-tanks had told him that their party was not going to make it. And this helped Daim and PH leaders to work out an appropriate strategy, giving them the additional confidence that they would win big. I said typical because Daim has an information gathering mechanism that is reliable and accurate. In the 2008 general election, Daim told the country via an interview with a Chinese newspaper that the BN would lose five states. The BN, then led by Tun Abdullah Ahmad Badawi, did lose five states — Penang, Perak, Kedah, Selangor and Kelantan. Kelantan was already an opposition state then. This time around, the strategy was straightforward: discredit the BN and its leaders and make Dr Mahathir the rallying point to save the country. Remember the “You’re not alone” poster? This worked well as other personalities came out to show their support for Dr Mahathir, with Tan Sri Rafidah Aziz being one of the most visible and vocal. Wednesday’s interview also had Daim giving his views on why BN was rejected by the people. Umno leaders were simply arrogant, he said, adding that they were also ill-mannered and complacent. Umno’s fixed-deposit constituencies came under attack from the PH forces, a great number of them comprising ordinary folks who had grown tired of the old coalition. Abuse of power and a head who could not be criticised plus a civil service that saw some key senior officers taking part in political campaigns eventually led to BN’s downfall. “Duit tak turun (the money didn’t come down),” Daim said, referring to money meant for campaigning purposes was not properly distributed, thus hampering work on the ground. Well, it’s all gone down as part of the country’s political history. Daim has a vast reservoir of first-hand knowledge in many aspects of the country’s development, with personal involvement in many of them too. This interview would be seen again and again and widely analysed by those interested in the country’s welfare. If the programme was not capped to one hour, more juicy stuff would have been revealed. The Umno activist reviewed the interview many times and concluded that Daim is as relevant as ever. Not many people doubted that.